Posted August 28, 2012 at 1:52 p.m.
SALT LAKE CITY (AP) — Cody Larsen has always looked out for his little brother, whether it was sliding extra mashed potatoes onto his plate or calming his nerves when he made his first start as a high school freshman. 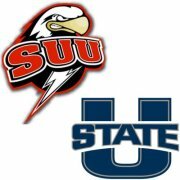 That all changes Thursday when the two linemen go head to head for the first time when Southern Utah travels to Logan to take on Utah State in the season opener for both teams. Although they're three years apart, Cody and Tyler frequently are mistaken for one another — even by their mother. It doesn't help that both wear No. 58, something that at least will make it easy for torn family members cheering them on Thursday. "They're talking about trying to sew two shirts together, one for SUU and one for Utah State," the 21-year-old Tyler said of his parents. "It's going to be different. We've never been able to do this before. We were on the same side of the ball in high school, so it's an entirely new experience. It will be interesting." Tyler has started 25 straight games at center for Utah State and earned first-team all-WAC honors in 2011. This is the second straight season he's on the Rimington Trophy Watch List, an award given to the nation's top center. He's also a candidate for the Outland Trophy and Lombardi Award. Cody, 24, is a two-time first-team all-Great West Conference honoree and three-year starter on the defensive line for Southern Utah. In his career, he has 82 tackles, 16.5 tackles for loss and 12 sacks. He figures he'll be up against Tyler about half the defensive snaps as he flops between defensive tackle and nose guard. "Tyler is so strong and Cody is so fast, it will be interesting," said their father, LeRoy Larsen of Draper. "They're evenly matched." Ask each player who is better looking and a different story emerges. "I'd have to say me," said Tyler, a statement Cody disputed a few minutes later. Both acknowledge they look quite a bit alike, down to the goatees they sport. "We get mistaken for each other all the time," said Cody, who visited with his brother Sunday at the family home one last time before the big game. "I'll get asked how Utah State is going to be this year, and who's going to start at quarterback." While the Larsen boys have plenty on the line, so do their respective teams. Southern Utah opens its Big Sky era, while Utah State is playing in its final season in the Western Athletic Conference minus three players drafted into the NFL — running backs Robert Turbin (No. 106 overall, Seattle) and Michael Smith (No. 212, Tampa Bay), and linebacker Bobby Wagner (No. 47 overall, Seattle ). The Aggies under fourth-year head coach Gary Andersen aim to play in consecutive bowl games for only the second time in history (1960-61). They return 14 starters from a 2011 team that won its final five regular-season games. Southern Utah's 2011 season included its first win over an FBS-level school in more than a decade (41-16 over UNLV). This year, for the first time in their history, the Thunderbirds will compete for an automatic playoff berth. "I wouldn't call it pressure, but we've been fighting for a long time to get that spot in the Big Sky and we finally got it," Cody said. "We've got a lot to prove. We can't let down on the throttle. Our goal is to win the conference championship this year so we'll do everything we can do to get that." Even if it means going through little brother? "That's for sure," Cody said. Growing up, Cody was always the skinny, scrawny brother, and didn't hesitate when Tyler spotted leftovers on Cody's plate. "Tyler would always look at me, want my extra food," Cody said. "I'd slip it on his plate. He definitely would eat my scraps. I take credit for why he's so big." The 6-foot-4 Tyler tips the scales at about 315 pounds, while Cody is a hair under 6-4 and weighs 298. How did they end up at different in-state schools? Cody went on his church mission and chose SUU and thought Tyler was headed there as well for the 2009 season until Utah State came through with a late scholarship offer. An injury early that season, however, kept Tyler from playing against big brother then. "I've been bugging my coaches to get Utah State (back) on the schedule. As soon as I found out, we haven't stopped talking about it," Cody said. "At the beginning, he'll be nervous and I'll be nervous, but at the end, I'll be pretty emotional." He won't be alone. There are two other Larsen brothers, both in jersey No. 58, waiting in the wings. Zach is a standout senior lineman at Jordan High School, and youngest brother Collin is just 13 but already weighs 160 pounds. "My proudest moment was when both (Cody and Tyler) both started one game (together) in high school," said their father. "They were the Larsen bookends ... Now we're just excited. All we can say is we'll be cheering every play."